5N700AACW: 6.0 volt 700mAh rechargeable Ni-Cd AA battery pack. Home > RC Hobby > Receiver Battery Packs > 5N700AACW : 6.0 volt 700mAh SANYO Ni-Cd AA receiver battery pack. Choose shape, and choose wire leads or Connector. 5N700AACW : 6.0 volt 700mAh SANYO Ni-Cd AA receiver battery pack. Choose shape, and choose wire leads or Connector. 5N700AACW : 6.0 volt 700mAh rechargeable Ni-Cd receiver battery pack. Made with five N-700AAC "AA" size cells. 6-volt battery packs provide better operating voltage for larger servos, and when long servo wires are used. Choose Pack Shape, and choose wire leads or Connector from scroll-down menus. Pricing reflects options chosen. These battery packs are made by US right here in the U.S.A. Pricing effective April 2019. JR-SPEkTRUM-HiTEC charging adapter with banana plugs. Has JR-SPEkTRUM-HiTEC-AIRTRONICS Z female connector at one end, and banana plugs at the other end. Enables charging of receiver and transmitter battery packs with smart chargers. 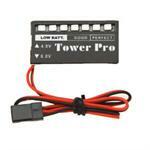 Tower Pro V : Battery checker & monitor for RC models. Plugs into receiver. For 4.8v & 6.0v battery packs. Has 7 LED lights to indicate battery voltage & status. Can adhere to outside of flying model, so you can see it during flight. 5N700AACBB: 6.0volt 700mAh rechargeable NiCd battery pack for Bumper Boy transmitters. Dimensions: 2" tall, 2.75" across, 0.57" thick. Has custom longer-length wire leads to connector. 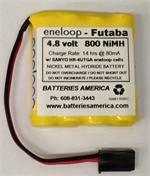 BK-4MCCAW: 4.8 volt and 6.0 volt 800mAh AAA-size ENELOOP READY-TO-USE receiver battery packs. Choose 4.8 volt or 6.0 volt, choose shape, and choose Connector or wire leads. Packs are MADE IN USE by Batteries America. 1250mAh Ni-Cd receiver battery pack, made with Panasonic-Sanyo N-1250SCR "4/5 Sub-C" size Ni-Cd cells (1.3" tall, 0.8" dia.). These can be fast-charged or slow-charged. Choose voltage, shape, and connector. 5KR1100AAU: 6.0 volt 1100mAh rechargeable Ni-Cd receiver battery. Choose shape and Connector. 5KR1100AAU : 6.0 volt 1100mAh rechargeable Ni-Cd receiver battery. Choose Pack Shape, and choose wire leads or Connector from scroll-down menus. Pricing reflects options chosen. CellMeter-7: Digital Battery Capacity Checker - for LiPO 1-7 cells, LiFe 1-7 cells, Li-ION 1-7 cells, NiCd 4-7 cells, NiMH 4-7 cells. Checks voltage, capacity, individual cell V, V difference. Now includes balance function for Li types! 5N1300SCRW: 6.0 volt 1300mAh SANYO larger-scale Ni-Cd receiver pack. Made with 5 x N-1300SCR Sub-C size cells. Choose Pack Shape, and choose wire leads or Connector from scroll-down menus. Pricing reflects options chosen. 5KR1300SCW: 6.0 volt 1300mAh Ni-Cd receiver battery packs for RC. Made with KR-1300SC "Sub-C" cells. Choose Pack Shape and Connector from menus. 5HRAAUW: 6.0 volt 1650mAh rechargeable NiMH high-capacity AA receiver battery pack. Made with HR-AAU 1650mAh "AA"-size cells. Choose shape, and choose wires or Connector. 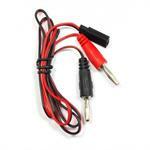 LED Switch Harness - for RC receiver; has LED battery voltage indicators. Mounting hardware included. Compatible with 4.8v and 6v Rx systems. Choose Futaba or JR-SPEkTRUM-HiTEC-Z style. N1900SCRW: 1900mAh SANYO NiCd RC battery packs, made with N1900SCR Sub-C cells. Choose Voltage, Shape, and Connector. 1900mAh SANYO Ni-Cd Fast-charge receiver pack. Made with # N-1900SCR Sub-C size high-capacity cells. Heavy-duty; can be FAST or SLOW charged. Choose Pack Voltage (4.8v or 6.0v), choose Shape, and choose wire leads or Connector from scroll-down menus. HRAULW : 2150mAh Ni-MH receiver Battery Packs, made with 4/5A-size cells. Choose Voltage (4.8v or 6v) , Shape, and Connector. HRAULW : 2150mAh rechargeable Ni-MH receiver battery packs. High-capacity, long-life, compact size! Made with HR-AUL 2150mAh "4/5A"-size cells (cells are1.75" tall). Choose Voltage (4.8v or 6v), Shape, and Connector. HRAUW : 2700mAh Nickel Hydride long-life Receiver battery packs. Made with # HR-AU 2700mAh "A"-size premium battery cells (slightly fatter than a AA cell). Choose Voltage, Shape, and connector. 5BK-3MCCAW: 6.0 volt 2000mAh eneloop high-capacity rechargeable receiver battery packs. PRE-CHARGED & READY TO USE. Made with 5xENELOOP 2000mAh cells. High-quality, high-capacity, memory-free, & long storage life. Choose Shape, Conn., etc. 5KR1800SCEW: 6.0 volt 1800mAh Ni-Cd high-capacity receiver pack. Choose shape and connector. 5KR1800SCEW: 6.0 volt 1800mAh Ni-Cd high-capacity receiver pack. Made to order with 5 x KR-1800SCE "Sub-C" size cells. Each cell is 1.75" tall x 0.8" diameter. Choose Pack Shape, and choose wire leads or Connector from menus. 5HR3U2500W : 6.0 volt 2500mAh high-capacity NiMH AA-size receiver battery. Choose Pack Shape, and choose wire leads or Connector from scroll-down menus. Pricing reflects options chosen. 5HR3U2700W: 6.0 volt 2700mAh highest-capacity AA-size NiMH receiver battery pack. Made with HR-3U2700mAh AA size cells. Choose Pack Shape, and choose wire leads or Connector. Pricing reflects options chosen. N2500SCRW: Ni-Cd Fast-charge receiver battery pack. Made with premium Panasonic-Sanyo N2500SCR Sub-C size battery cells. Heavy-duty AND high-capacity; can be FAST or SLOW charged. Choose Voltage (4.8v or 6.0v), Shape, and connector. 5BK-3HCCAW : 6.0 volt 2550mAh eneloop pro RC receiver battery packs. PRE-CHARGED. 5BK-3HCCAW: 6.0 volt 2550mAh eneloop pro high-capacity receiver packs. Made with 5 eneloop pro AA-sized cells. High-capacity, memory-free, & long storage life. Arrives PRE-CHARGED and READY TO USE ! Choose Shape, Conn., etc. 5HR3000SCU : 6.0 volt 3000mAh NiMH battery for larger scale RC. Choose Pack shape & Connector. 6.0 volt 5000mAh rechargeable long life RC battery packd. Made w/ 5 x KR-5000DE "D" size cells. Weighs over 1.5 pounds. Choose Pack Shape, and choose wire leads or Connector from menus. Pricing reflects options chosen. HR-DUW : 10,000mAH NiMH battery packs, made with HR-DU "D"-size rechargeable NiMH battery cells. Choose 4.8v or 6v, choose shape, and choose connector. UP100AC: High Quality Ultra Power UP100AC DUO 100W LiIo/LiPo/LiFe/NiMH/NiCD Battery Balance Charger/Discharger. 2-channels - charges 2 different batteries at the same time. Includes set of adapters, wall power cord, instructions.